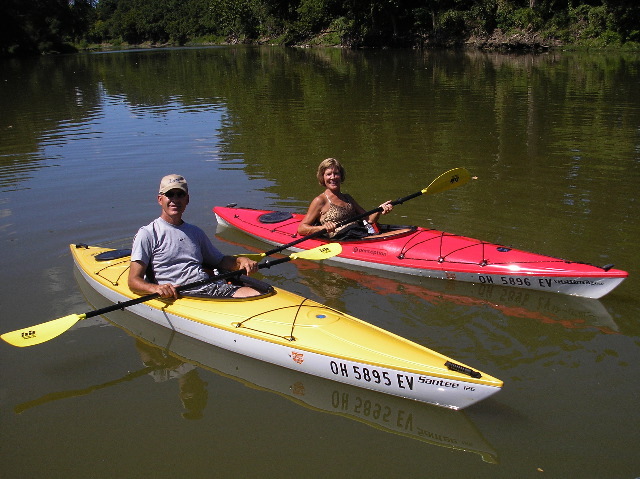 Bob and Lou Ann Limbird of Napoleon, Ohio paddling around the north side of Girty's Island. An increasing number of people are kayaking in the Maumee River. Kayakers can be seen along the Maumee River from the Henry County Park's Miami Wabash and Erie Canal Hiking Trail. The canal was used from 1843 until 1913. Kayakers can gain access to the Maumee river at Independence Dam State Park, Florida Ohio (at Independence Dam State Parks Parking lot next to the Florida Bridge), Napoleon Ohio's Meyerholtz Park and the boat docks at Ritter Park, as well as, Ohio's Mary Jane Thurston State Park's North Turkeyfoot Access just east of Henry County Road 6C. Florida, Ohio to the Boat Docks at Napoleon's Ritter Park. ﻿﻿﻿In 2006 the 21st Annual Maumee Valley Tri-Adventure race (sponsored by The Volunteer Connection of Northwest Ohio and The Naturalist Scouts) used the canal for a kayak/canoe race. The 50-mile race consists of a 6-mile paddle, an 8-mile hike carrying 20 percent of a participate's body weight and ended a 35-mile bike ride. Because of high water in 2006 the Maumee was not useable for the paddle canoe/kayak leg of the race. The sponsors instead used the Miami Wabash and Eric Canal. Competitors paddled from lock #13 at Independence Dam State Park to Gessner Park in the Villiage of Florida, Ohio. The blogger at http://www.paddling.net/places/showReport.html?1386 reported high water in the canal made the use of the canal possible for the event. Dead logs, vegetation and sandbars would have to be removed from the canal before canoes and kayaks could easily use the waterway. Share your kayak photos and stories on Facebook at Henry County Parks. What is the make of your kayak? Describe your kayak. Where did you enter and exit the Maumee? Any photos of your trip? Be apart of the conversation.